There are two sights in human life which fill the heart with profound sorrow. The first sight is that of a person who has sank amid the troubled waters of life. It is the one whose once youthful face is no more because of rough, hard living. It is the person who had a good raising, who wore good name but now they have sank to the depths of moral degradation. The sight of a person who has sank is one of the most pitiful scenes of this play we call human life. But to our human eyes there is another sight which is no less tragic than that first and that is the sight of a person who is beginning to sink. More often than not, beginnings are small and insignificant but the events they set in motion can produce monumental results. Such as the innocent drink that was the beginning of a life of addiction; or the telling of a little white lie that was the beginning of a life of deceitfulness. So much of what we know and understand about life comes from the study of beginnings. And in our text this morning we have an instance, not of a man who has sank into the depths, but of a man who is beginning to sink. Shall we look at Peter in that light for a little while this morning? I want to share with you five lessons we can learn from Peter and when he was beginning to sink. Our Best Qualities Could Lead To Our Ruin – The first lesson that comes to mine is that it was Peter’s personality that put him in this danger. He began to sink because he was Simon Peter. The other disciples were all safe. It never occurred to them to leave the vessel. They were men of common sense and they knew the difference between land and water. But Peter was reckless, headstrong and impulsive. Peter followed the dictates of his heart, and it made him do what no one else would do. But those very qualities that in the hand of Christ were to be used to build up the church sometimes brought him to the verge of ruin. It was only Peter who would begin to walk on water, and it was only Peter who would begin to sink. We Can Sink In Familiar Waters – The next thing to arrest my attention about Peter beginning to sink is that he began to sink in very familiar waters. I suppose if you would have asked him if he knew the waters of the Sea of Galilee, he would have replied that he knew them, like the back of his hand. He knew every square inch of that lake and it was there, in these familiar waters that he began to sink. It is a very sad thing when a person begins to sink away from home. We almost understand those instances better. We understand why the Prodigal began to sink because he was in a far country (Luk 15:13). We can almost empathize with Peter when he was in the court of the High Priest and he denied Jesus because he was in an unfamiliar place, surrounded by strange, hostile people (Mat 26:69-75). But here on the Sea of Galilee it was different. Here on the waters of the lake he loved he was at home. Here this night he was among those who knew him best and who loved him and here he began to sink. We see this principle in the life of David when he allowed his eyes to stray while in the familiar surroundings of his home (2 Sam 11:1-4). My friends, if two of the greats of the bible; Peter and David can begin to sink while in familiar settings is it any wonder that we too can begin to sink in the familiar settings of our own lives. Take for instance the home. Can we not begin to sink while in the familiar settings of our homes by watching sinful material on TV, by the music we listen to, by the websites we might visit, or the video games we play (Eph 5:3-7). Take the assembly as another example. We become familiar with our settings here and before long we are sinking and may not even know it. We sing our songs but we are too familiar with them and the words then become meaningless. We pray but really we do not give any thought to the majority of our words their just phrases we use. We become too familiar with the preacher so we tune him out. And before long we are no better than the Pharisees who would draw near to God with their mouths… but their hearts were far from Him (Mat 15:8-9). The remedy is to never let down our guard, to remember that Satan is a roaring lion looking for whom he may devour and he will attack us when/where/form we expect him to and he will attack us where we least expect it, the sanctuary of familiar places. 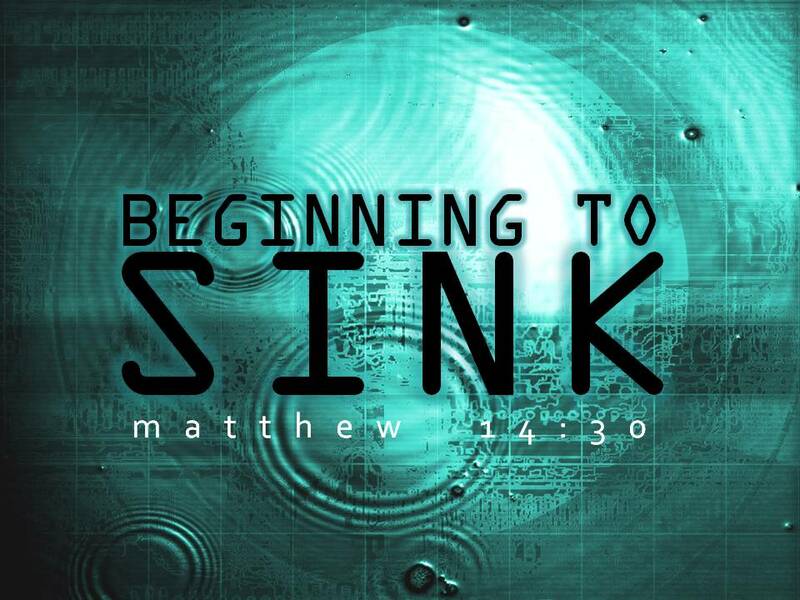 Peter Began to Sink When He Took His Eyes Off Jesus – We would be amiss if we did not take note of the fact that Peter began to sink when he began to fear by taking his eyes off Jesus (Mat 14:30). There is not a trace in the scriptures that the wind had grown fiercer while Peter was walking on the water. There is no hint that the wind was more boisterous than when he left the boat. But when Peter took his eyes off the Lord he began to fear his surroundings and that is when he began to sink. We also see this principle in the church at Ephesus. According to the words of Jesus (Rev 2:1-7) the church at Ephesus was a congregation that was faithfully engaged in the work of the Lord. The Lord acknowledges their work, their patient endurance, their contempt for false teaching and they were a church who had not grown weary in serving the Lord (Rev 2:2-3). But they were a church that was beginning to sink. The charge against them was that they had “left their first love” (Rev 2:4); they had taken their eyes of the Lord. The lesson for us is that the winds of worry and the waves of despair have no effect on us so long as we keep our eyes of Jesus. The remedy is simple, “look unto to Jesus, the author and finisher of our faith” (Heb 12:2). So long as our eyes are affixed to him the sea of life will be as pavement and we will walk and not sink. Christ Is Never Far Away – Are you beginning to sink? Have you let the best qualities of your life get the better of you? Have you let your guard down in familiar places and that has caused you to sink? Have you taken your eyes off of Jesus? And so we close by saying that when Peter began to sink, his Savior was not far away. Immediately He put out His hand and grasped him. My dear friends, let us never forget that Christ is at your side. All human help may seem very far away; but we must remember that He is not very far away. He is near you now; near you where you sit. You need Him because you are sinking and He is there for you. Cry out now, “Lord, save me!” and He will do it to the uttermost for you.